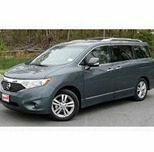 Nissan is recalling certain 2011 & 2012 Nissan Quest minivans for a problem related to a fuel delivery issue. Affected vehicles may stall out when being driven slowly downhill, said the company. According to the National Highway Traffic Safety Administration (NHTSA), 23,531 of the Quest minivans are affected by the issue. The recalled minivans were manufactured from July 29, 2010 through February 21, 2012. Nissan says the problem is due to software programming. When the vehicle is traveling at a slow rate of speed or idling while going downhill, and there is less than a quarter of a tank of gas, the engine may stall without warning. Nissan notes that a stall can increase the risk of a crash. Nissan said it will beginning contacting owners to ask them to take their Quest minivans to Nissan dealerships for a free replacement of the fuel pump control module. They are expected to begin contacting owners around mid-March. Owners are also being told they can contact Nissan at 1-800-647-7261 for additional information, or visit the NHTSA’s website at http://www.safercar.gov and reference the NHTSA campaign ID Number: 12V076000.